From MBC Minute Book 16 June 1887.
he Montreal Herald of June 15 says: Decidedly one of the most meritorious performances in the shape of bicycle riding took place last night, when Master Bertie Lane, son of Mister A.T. Lane, succeeded in riding up the whole of the steep and by no means well-laid, Cote des Neiges hill, beating his father, J. Robertson, J.T. Barlow, F.Scott, and E. P. Baird thus winning a most unique and hard contest. The distance is just over a mile, and the angles of the hill, which is shaped like three exaggerated steps, have been calculated to be about 26 degrees. Messrs L. Smith, T. Gaendigner and L. Rubinstein officiated as judge, each taking charge of a third of the distance. Precisely at 7:30 p.m. Mr. Palmer sent of Robertson. He succeeded in reaching as far as the bend opposite Beard’s Ave, when he commenced to tire,and, endeavoring to turn towards the farm wall, lost command and fell. Two minutes were allowed between each competitor. J.T. Barlow was next to try, but he succumbed at the same spot that knocked Robertson out. Mr A.T. Lane and his boy, Master Bertie, commenced together, the father leading until McGregor Avenue was reached. Here the severity of the hill told its tale, and his progress was very slow. 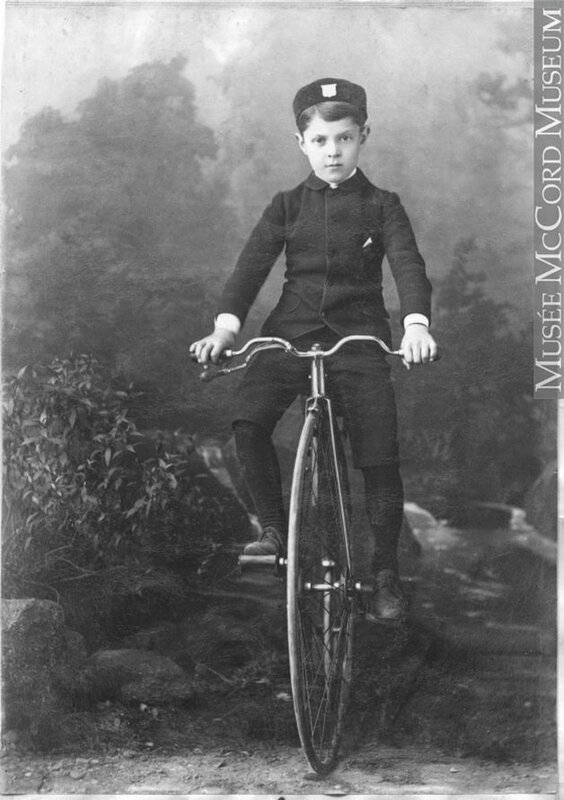 Bertie Lane, riding with wonderful ease and command over his bicycle, then passed his father, amid the cheers of a number of spectators ; then, taking a corkscrew course up the rest of the hill gradually made his way up the severe bit just below the lookout over the Priest’s farm, which, should be stated was very rutty. Some five yards before the crest of the road the little boys legs seemed to stop motion, but ere the conveyance could topple over he was at it again, and most pluckily did he stick to it, for a minute later he had accomplished the ascent, and having ridden about five yards further, tumbled onto his feet the winner of the silver and gold medal presented by Sport and the vanquisher of the Association’s best Wheelmen. Bertie Lane’s exact time was 10m, 20 s. After a rest, the M.B.C., thirty two in number, rode to the Athletic Clubhouse. “H.R.H.” Allen Lowe, Le Mesurier, T. Barlow, and Mr. Baylis delighted the large crowd with their songs, the first-named “In spite of the pants, got there all the same”. H. Joyce was in command. L'Herald de Montréal du 15 juin dit: Décidément, l'une des performances les plus méritantes en forme de vélo a eu lieu hier soir, lorsque Maître Bertie Lane, fils de monsieur A.T. Lane, a réussi à remonter l'ensemble de la colline Cote des Neiges, en pente et pas bien emportée, battant son père, J. Robertson, J.T. Barlow, F.Scott et E. P. Baird gagnant ainsi un concours unique et difficile. La distance est d'un peu plus d'un mille, et les angles de la colline, qui a la forme de trois étapes exagérées, ont été calculés à environ 26 degrés. MM. L. Smith, T. Gaendigner et L. Rubinstein ont été nommés juge, chacun prenant en charge un tiers de la distance. Précisément à 19h30. M. Palmer a envoyé de Robertson. Il a réussi à atteindre le virage en face de l'avenue Beard, quand il a commencé à se fatiguer, et, en essayant de se retourner vers le mur de la ferme, a perdu le commandement et est tombé. Deux minutes ont été autorisées entre chaque concurrent. J.T. Barlow était à côté d'essayer, mais il a succombé au même endroit qui a frappé Robertson. Monsieur A.T. Lane et son garçon, Maître Bertie, ont commencé ensemble, le père menant jusqu'à l'avenue McGregor a été atteint. Ici, la gravité de la colline a raconté son histoire, et ses progrès étaient très lents. Bertie Lane, avec une grande facilité et un commandement sur son vélo, passa son père, au milieu de la joie d'un certain nombre de spectateurs; Puis, en prenant un parcours de tire-bouchon, le reste de la colline remonta progressivement le lourd morceau juste en dessous de l'avant-garde de la ferme du Prêtre, ce qui, disait-on, était très rutty. Quelque cinq mètres avant la crête de la route, les jambes des petits garçons semblaient arrêter le mouvement, mais avant que le moyen de transport ne puisse remonter, il l'était encore, et il s'arrêta de lui, pour une minute plus tard, il avait accompli l'ascension, Et ayant parcouru environ cinq mètres de plus, se sont déchaussés les gagnants de la médaille d'argent et d'or présentée par Sport et le vainqueur des meilleurs Wheelmen de l'Association. L'heure exacte de Bertie Lane était de 10 m, 20 s. Après un repos, le M.B.C, trente-deux en nombre, se rendit au Athletic Clubhouse. "H.R.H." Allen Lowe, Le Mesurier, T. Barlow et M. Baylis ont ravisé la grande foule avec leurs chansons, le premier "Malgré le pantalon, c'est tout de même". H. Joyce était au commandement. The exact route followed is a bit of a mystery. The Goad map from 1881 shows the location and names of the roads at that time (1887). I believe that the "lookout over the Priest's farm" was on the south side of Cedar Ave where the present day Montreal General Hospital stands. It does have a excellent view of the College de Montreal, a former Seminary. The high point of CDN road is near the present day Trafalgar Apartments which looks out to the area west of the Seminary is also possible. They may have started at Sherbrooke and Simpson, then passd McGregor (present day Dr Penfield). The section north of Dr Penfield to Pine Ave is now called McGregor. There is a small laneway to the McConnell house, located at what was marked at S.W. Beard's land called Avenue Steyning. If this laneway existed in 1887 it may have been called Beard's Ave. To reach the lookout over Priest's farm they would go on Pine Ave then up a steep section of Cedar. The "severe bit" just below the lookout would be the steep section of Cedar Ave just east of the Montreal General Hospital. Alternatively they may have started at Cote Des Neiges and Sherbrooke., and proceeded up CDN to Cedar Ave. Then approached the lookout from the west by going up Cedar Ave. Again there would be a "severe bit " near the look out a;though not as steep as the eastern approach. In this case "the bend opposite Beard's Ave" would be the bend in CDN at Pine Ave which does indeed lead to the S. W. Beard estate. The look out could have been at the Montreal General Hospital if they followed Cedar Ave or the Trafalgar Apartments if they continued on CDN.